GRAND FORKS - The 8th annual Championship Tae Kwon Do Invitational Tournament will be hosted at Red River High School in Grand Forks, ND on Saturday, December 8. The tournament is participating in the “Kick Hunger for the Holidays” hunger relief effort to raise food to feed the hungry in the community. The doors open for registration at 9:00 am, and competition begins at 11:00 am. Martial artists from around the upper Great Plains states will compete in demonstrations of Tae Kwon Do forms, weapons, breaking, and sparring. Competitors of all ages and rank will have the opportunity to test their skills in mental and physical discipline, creativity, and technique. The sparring competition this year features a double elimination format, allowing each participant additional matches and more chances to test their skills against other competitors. 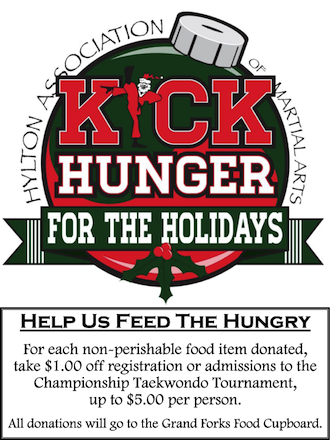 In addition to providing an opportunity for martial artists to demonstrate their skills, the Hylton Association of Martial Arts is participating in “Kick Hunger for the Holidays” to raise donations for the Grand Forks Food Cupboard by providing a discount to attendees. For each non-perishable food item donated, the registration or admission price is reduced by $1, up to $5 total per person. Admission for spectators is $4 for adults, $3 for kids (12 and under), and free to those under 5 years of age.